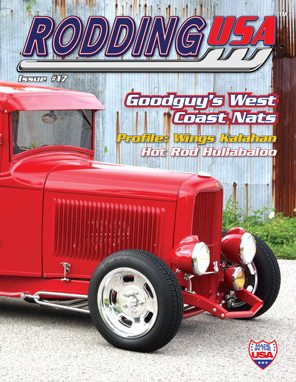 Rodding USA magazine's Issue #17 is available to order now. Magazines ship 7th Nov.
Issue#17 features six top features on traditional hot rods like Bart Grange’s 1932 Ford coupe, Brad Oaks 1932 Ford roadster, Shane Lile’s 1927 Ford sedan, Robert St. Sauveur’s 1929 Ford roadster, Keith Bush 1932 Ford sedan, and Henry Dana’s 1932 Ford pickup. Our Special Features section includes articles on t the Randy Cannarozzi Collection a Profile on Mr Hot Rod Radio Wings Kalahan and an update on our Project Roadster Pickup – Part 2. Our events coverage for this issue extends to the Goodguy’s West Coast Nationals in CA plus the Hot Rod Hullabaloo in KY. Find out how to create a No Leak Windshield in our Tech article plus our regular columns, showcases and our growing dealer network. Rodding USA, by hot rodders, for hot rodders.